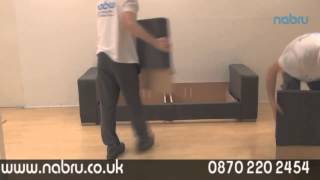 Nabru self assembly sofas are designed to fit easily into your home whatever your access restrictions without the need for tools, bolts or screws. We've successfully delivered our sofas to every conceivable difficult to access location including boats, lofts, cellars, caravans and up spiral staircases. Of course you don't just have to use our sofas for difficult to access locations, their unique modular design means that you can purchase a tailor made sofa that fits your personal taste and style perfectly for a very affordable price. All Nabru self assembly sofas also come with many options that allow you to customise them to your personal taste and style, one important option that we offer is the seat comfort level that lets you get the comfort level that you want. Please note that all of our sofas also come with a back cover which is pictured here. 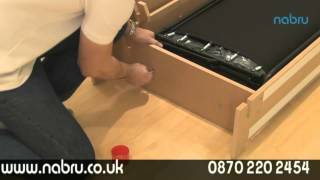 Sofa beds are just as easy to assemble as the sofa bed mechanism replaces a number of the frame parts. Our sofas are just as easy to disassemble as they are to assemble so no matter how many times you move in the future it will be easy to take your Nabru sofa with you. In the unlikely event that you have any problems with the assembly process we are at the end of the phone ready and willing to help.